The Golden Bough: A Study in Magic and Religion ('Liber rami aurei: tractatus de rebus magicis et religiosis') est commentarius de religionibus et mythis ab Iacobo Georgio Frazer anthropologo Britannico scriptus. Prima huius operis editio duobus voluminibus anno 1890 divulgata est; tertiam autem editionem auctor in duodecim volumina extendit annisque ab 1911 ad 1915 edidit. Origo operis Frazeriani fuit mythus late notus, multis modis repetitus, de iuvene qui veterem regem interficit regnoque succedit. Incipit a successione regum Nemorensium fano Dianae iuxta Ariciam institutorum. Titulus autem ex Aeneidos libro sexto deducitur, in quo Aeneam et Sibyllam, ut in regnum inferorum intrent, ramum aureum praeferre oportet. Robert Ackerman, The Myth and Ritual School: J. G. Frazer and the Cambridge Ritualists. 2002. ISBN 0-415-93963-1. Mary Beard. 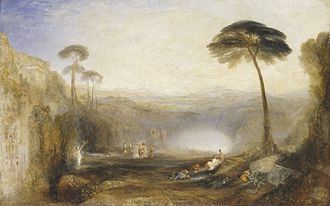 Frazer, Leach, and Virgil: The Popularity (and Unpopularity) of the Golden Bough. Comparative Studies in Society and History vol. 34 (1992) pp. 203-224. Eric Csapo, Theories of Mythology (Oxonii: Blackwell, 2005. ISBN 631-23248-6) pp. 36-43, 44-67. Robert Fraser, The Making of The Golden Bough: The Origins and Growth of an Argument. Londinii: Macmillan, 1990. Jonathan Z. Smith. When the Bough Breaks. In Map is not territory (Sicagi: University of Chicago Press, 1978) pp. 208-239. Novissima mutatio die 19 Augusti 2017 hora 11:48 facta.